Second in size only to the hyacinth macaw, which is the largest parrot, the green-wing macaw is often known as a gentle giant, due to its calm disposition. Its brilliant color and temperament make it a favorite family pet for those who have the space and time to care for such a large bird. Green-wing macaw, red and green macaw. The green-wing macaw is native to many of the tropical lowland forests of Central and South America, including Panama, Colombia, Venezuela, Ecuador, Guyana, Brazil, Peru, Suriname, French Guiana, Paraguay, Argentina, and Bolivia. It is found in virtually the same territory as the blue-and-gold macaw. The green-wing, as well as other macaws, has been kept in captivity as far back as the 17th century, but captive breeding took off in the 19th century and was fortunately quite successful. Today, it is relatively easy to find green-wing macaws that were bred in captivity. Nevertheless, like other tropical birds, this macaw has seen its natural habitat badly depleted, and many are still captured for the black market parrot trade. If you decide to adopt a green-wing macaw, make sure you deal with a reputable breeder who can verify the bird's status. Green-wing macaws are one of the larger parrot species, with mature adults measuring up to 40 inches from the beak to the tip of the tail feathers, with a wingspan of up to 49 inches. The largest adults can weigh as much as 60 oz. (3.75 lbs.). On average, a well-cared-for pet green-wing macaw will live for about 50 years, however, there have been reports of green-wing macaws living well into their 80s. Before you adopt one, make sure you're willing to make a lifetime commitment—or have children who want to inherit the bird. Those interested in adopting a green-wing macaw should keep in mind that these birds, however tame and affectionate they may seem, are still parrots and will behave like parrots. They get loud, and their screeching makes them unsuitable companions for those who live in an apartment or other close quarters. They are also avid chewers, and with beaks that are incredibly powerful, the potential for serious home damage or physical injury is present for a bird with behavioral problems. The green-wing macaw is one of the most recognizable of all the parrot species. These bright birds are a deep rich red on the head, shoulders, and breast, with a greenish band below the shoulders and wings. The green band transitions to dark blue on the wings, and there is light blue on the rump and on the tail covert feathers. The long tail feathers are red, tipped in blue. The legs and feet are a deep gray, and the beak is horn-colored with a black lower mandible. The bird has eye patches on the face. Males and females are indistinguishable, except that males are slightly larger. The pure drama of owning a huge green-wing macaw can easily blind potential owners to the expense and time required. This bird may cost you much in terms of time, feed, equipment, veterinary bills, and possibly home repair costs. It's best to be fully prepared for this before you adopt one and bring it into your home. This is not a bird commonly sold in pet stores, so you'll need to seek out a breeder in order to purchase a green-wing macaw. And because the green-wing macaw demands a lot from owners, it is a bird that is frequently surrendered to animal adoption agencies and rescue organizations. There is an excellent chance of finding a bird at one of these organizations. In the wild, green-wing macaws live in flocks of six to eight birds and are very social. Owners will need to spend plenty of time socializing with their pets. When you take a green-wing macaw into your home, you effectively become its "flock" and must include it in family activities. Green-wing macaws are highly responsive to training and must be given adequate attention and bonding time due to their social natures. This is important to remember, because a bored macaw is a destructive macaw. Green-wing macaws are known for being voracious chewers and can chew through a door frame or expensive molding with lightning speed. Green-wing macaws owners will need to invest in some good-quality chew toys and be ready to keep supplying them, as these are disposable items where macaws are concerned. A large macaw such as a green-wing needs a roomy cage—2 1/2 feet x 3 feet at a minimum. The green-wing is a somewhat quieter bird than some of the other large macaws, but this is a relative term—it is still a loud species and it may be best to keep your pet in a room where the disturbance to neighbors will be minimal. Mount a sturdy perch in the cage, and be prepared to replace it occasionally as it gets damaged. Food, water, and treat dishes are best mounted above the perch on the side of the cage. Branches within the cage will offer the bird climbing exercise. Provide a variety of toys for chewing and playing. A playpen structure at the top of the cage is a good idea. The green-wing macaw will also do well when kept in an outdoor aviary during warm weather, and also adapts well to an entire room dedicated as an indoor "bird room." Green-wing macaws, like all parrots, should consume a high-quality commercial seed and pellet mix in addition to daily servings of bird-safe fruits and vegetables. Most green-wings enjoy being hand-fed at the same time family meals are served. Green-wing macaws are known to eat some protein in the wild, and in captivity they will eat bits of cooked chicken. As with all parrots, avocado and chocolate are toxic. Although they are not as active as other large parrots, green-wing macaws still need plenty of exercise for both mental and physical stimulation, with about 2 to 3 hours of supervised out-of-cage playtime daily. Providing a separate playpen structure away from the cage will help occupy its time during these exercise periods. Proventricular dilation disease (also called Macaw wasting disease), a viral disease that causes intestinal problems as well as neurological symptoms. It is usually fatal, and the best preventive measures are to keep the birds isolated from other birds that might carry the virus. Psittacine beak-and-feather disease, a disease caused by a circovirus that kills the cells of the feather and beak and also compromises the immune system. It is usually fatal and is best prevented by making sure your bird has been properly quarantined before you buy it. Psittocosis, a bacterial disease that causes respiratory symptoms and eye discharge. Stressed birds are most susceptible, and prompt treatment with antibiotics can often cure the disease. Other problems that are less serious include allergies, and behavior problems such as feather plucking, which usually occurs in parrots that are bored or frustrated. 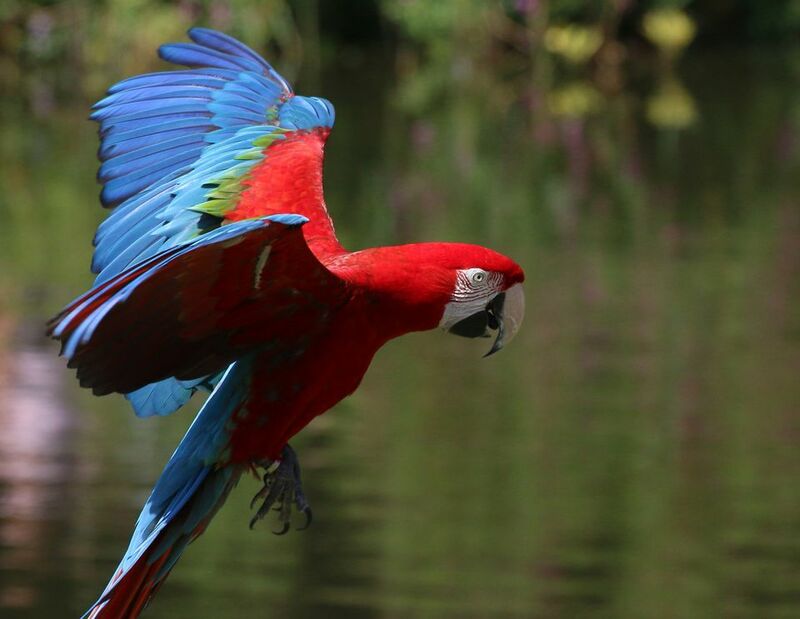 Otherwise, check out all of our other macaw species profiles.